The snow blower Yard Machine 31AH65FH829 is a 30 inch wide snow blower suitable for most urban driveway snow clearing requirements. The vender does not offer a commercial warranty on this machine. 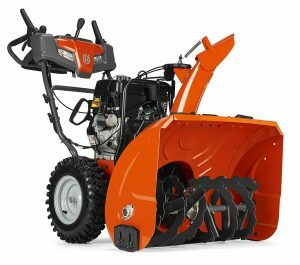 It comes with a 357cc OHV 4 cyc engine driving a 12 inch impeller which is capable of blowing snow a maximum of 40 feet under optimum conditions. This is a powerful snowblower. This snow blower has the standard 6 forward and 2 reverse gears / speeds. It comes with an in dash headlight as well as manual crank rotation chute. The chute is made of polymer material so it will not rust. 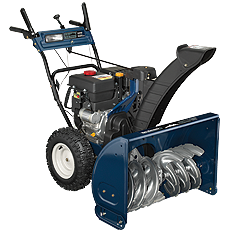 This particular snow blower is 30 inches wide which will clear snow quickly from your driveway, however you need to make sure you have a suitable spot to store this snow thrower while it is not in use. 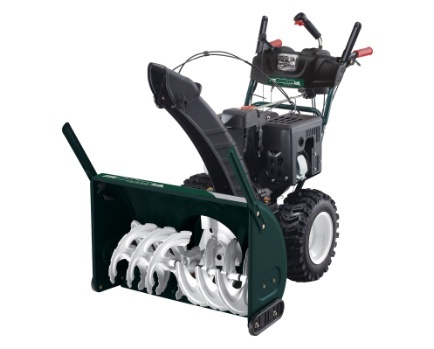 Warranty: This Yardman snow blower has a 2 year consumer warranty. A commercial warranty is not available. 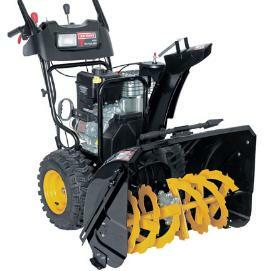 Use Snow Clearing Tool – This is the really important part. You have plugged the augers with snow, you have shut the machine off and now you are trying to clear the snow away. Never place your hands inside the augers to get at the snow. Use a broom handle if you have an old machine. Or the snow clearing tool that came with your newer machine to clear the snow. You can also purchase these tools from most stores as an extra if you break yours. If you have an older machine which does not have one. This is the safe way to clear snow from around the augers and the impeller. Like all snow blowers or snow throwers, maintenance is important for your machine to operate at a peak level for many years. Change the engine oil regularly, check the belts for tightness and change the spark plug as required. Grease any spots outlined in the manual. If you need to leave the snow blower outside all year round, cover the machine with a proper cover. This will keep it looking new and avoid deterioration of the tires and metal components. The Yard Machine Snow Thrower H65KH is the standard 30 inch wide snow thrower that most consumers find suitable for their snow clearing needs. 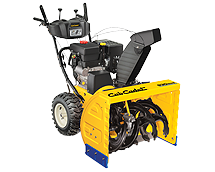 With the 30 inch wide clearing width and 21 inch height, it can deal with most situations that many urban consumers will face when it comes to clearing snow. It also has the standard 6 forward gears and 2 reverse gears that almost all snow throwers have in this class. The engine is a 357 cc engine, more than strong enough to deal with driveway snow clearing requirements. 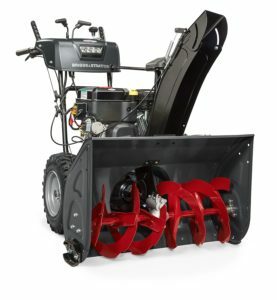 The augers and impeller are both 12 inches in diameter and this snow blower also comes with an in dash light for snow clearing at night. 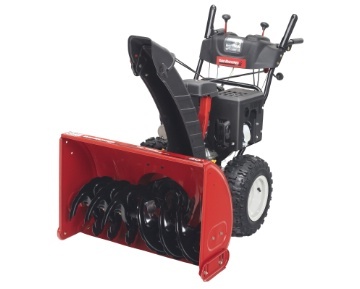 6 Forward, 2 Reverse Speeds: operate the snow blower to match the conditions. 16” x 6.5” Sno-Hog Tires: heavy duty treads provide maximum traction. Transmission: This 6 Forward, 2 Reverse Speeds: operate the snow blower to match the conditions. Consumers can assemble this snow blower in a matter of minutes with no tools needed. The engine is pre-filled with oil. However as with all snow blowers you should check the engine oil level prior to starting the engine the first time. It is a good habit to get into. Check the oil every time prior to starting the engine. Also add fuel and you are ready to go. Most customers will have to arrange for delivery of their new snow blowers. They are far too big to take home in your car. So you will need a trailer, rent a van or arrange for delivery by the store that you are purchasing the snow blower from. There will be a charge for this service, but it will be the easiest way to arrange for your new snow blower to be delivered to your home. Some stores will rent their vans/trucks to you for a very low price for 2 hours for you to take your purchases home. Lowes and Home Depot do this as well as others. 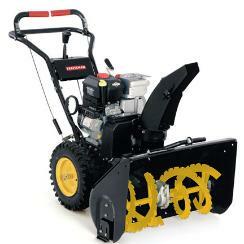 This Yard Machine Snow Thrower H65KH is a powerful machine and should be treated with safety in mind. Carefully read all of the safety guidelines in the manual prior to operating the machine for the first time and follow these guidelines to ensure that both you and the machine do not have an accident. 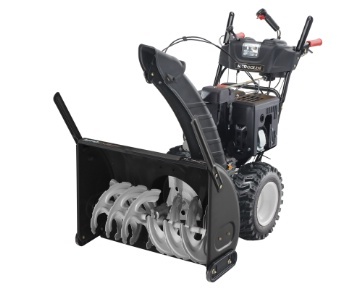 Prior to starting the Yard Machine Snow Thrower H65KH the first time each day, perform a quick walk around check of the machine to ensure there are no loose parts and no leaking fluids. Check the engine oil to ensure that it is at the correct level as specified by the manual. Top up if necessary. Fill the fuel tank while the engine is cold and prior to using the machine. If you do spill fuel, wait until it has fully evaporated prior to starting the engine. Never spill fuel on a hot engine to avoid fires and always fill the fuel tank outdoors to avoid any possibility of vapors going into your house.